itching, generalized urticaria, facial angioedema, asthma, gastrointestinal complaints, and diarrhea (Pradini and Marchesi, 1999) . Anliker et al. 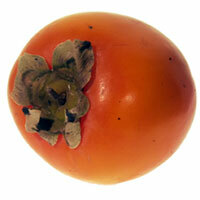 (2001)  demonstrated by blot and EAST inhibition that the carbohydrate determinants are responsible for cross-reactivity between persimmon and bromelain. They also found cross-reactivity to Bet v 2. Anliker MD, Reindl J, Vieths S, Wuthrich B.